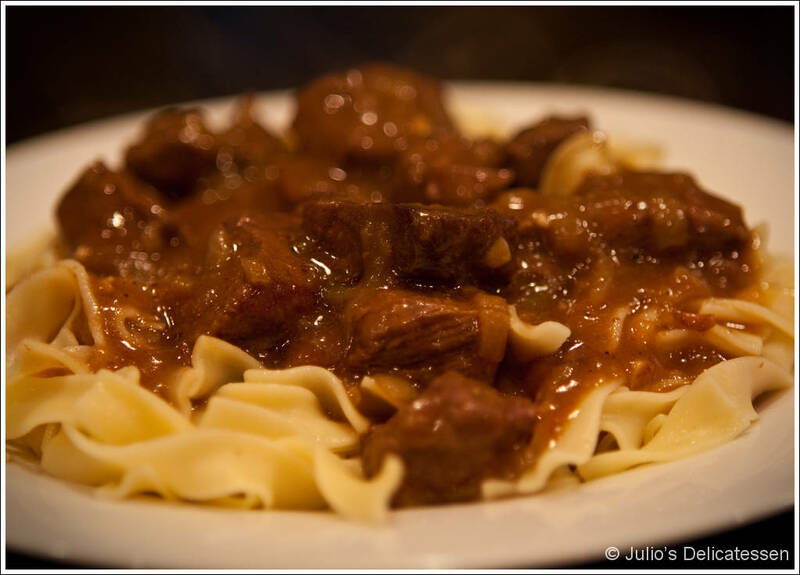 This dish is essentially Belgium’s answer to Beef Bourguignon. 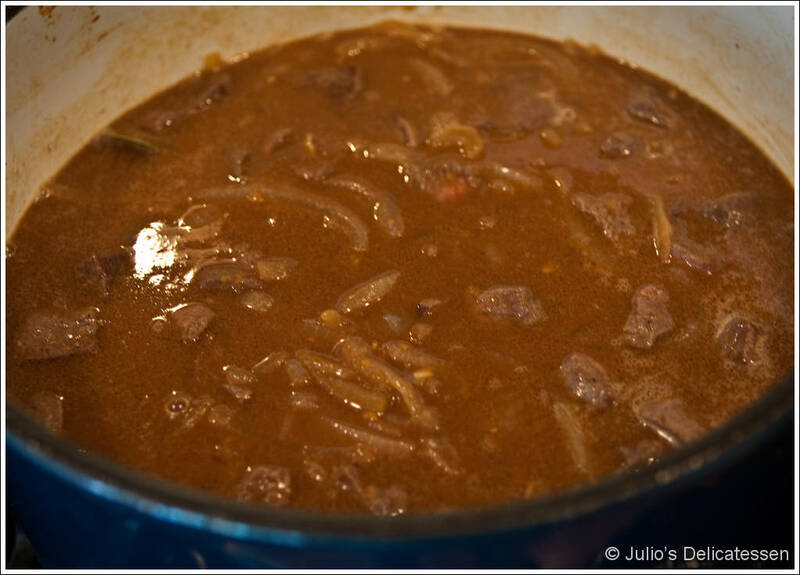 Traditionally, it’s made with just beef, beer, and onions, but the extra ingredients in this particular recipe enable a much deeper flavor and thicker consistency which I prefer. You really need to use some kind of dark beer here (Guinness works well and is easy to find, though a dark Belgian beer adds a nice, authentic flavor) to get the desired result. This can easily be made a day or two in advance and reheated. Preheat oven to 300 degrees. In a large Dutch oven, heat some oil over medium-high heat until almost smoking. Dry the meat with paper towels, then season heavily with salt and pepper. Brown the meat on all sides, working in batches to ensure the pan remains hot. Transfer to a platter as you work on the remaining batches. 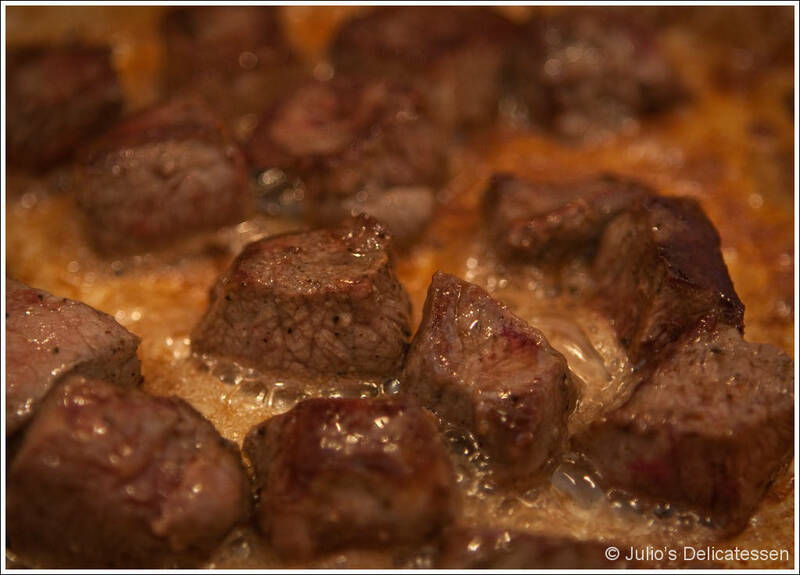 If the fond gets too dark as you’re doing this, deglaze the pan with some of the beef stock, scraping the fond as you do so, and pour over the browned beef. If you do this, add some more oil before proceeding. 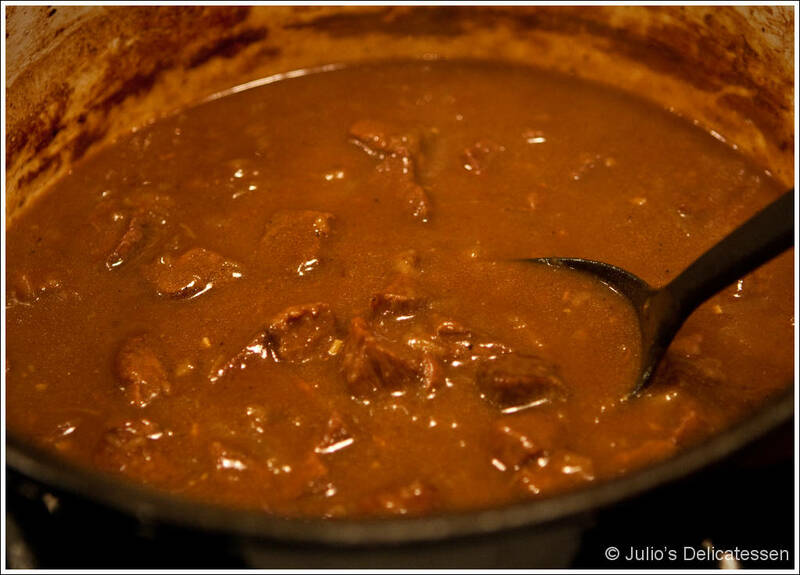 When all of the meat has been browned, make sure you still have some oil in the pot and turn the heat down to medium-low. Add the onions, some salt, and the tomato paste. Stir for about a minute to ensure the tomato paste is distributed evenly and the fond releases from the bottom of the pot. Allow to cook until the onions release some liquid, about 5 minutes. Increase the heat to medium and add the flour and garlic. Cook for about 4 – 5 minutes. Add the chicken and beef broth, stirring to combine and making sure to get all of the fond off the bottom of the pot incorporated into the broth. Add the beef (with any liquid that has accumulated), beer, boquet garni, and cider vinegar. 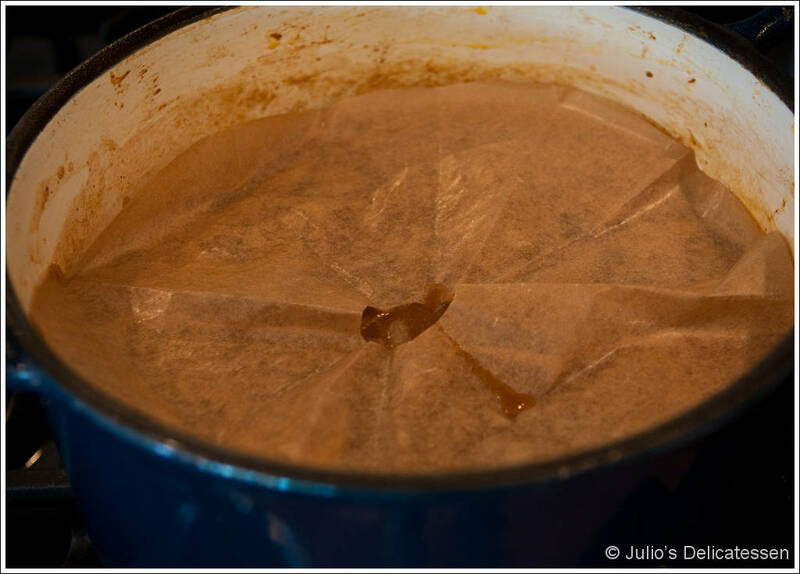 Bring to a simmer, then cover with a parchment lid and transfer to the oven. Cook for 2 – 2.5 hours, until the beef is very tender. 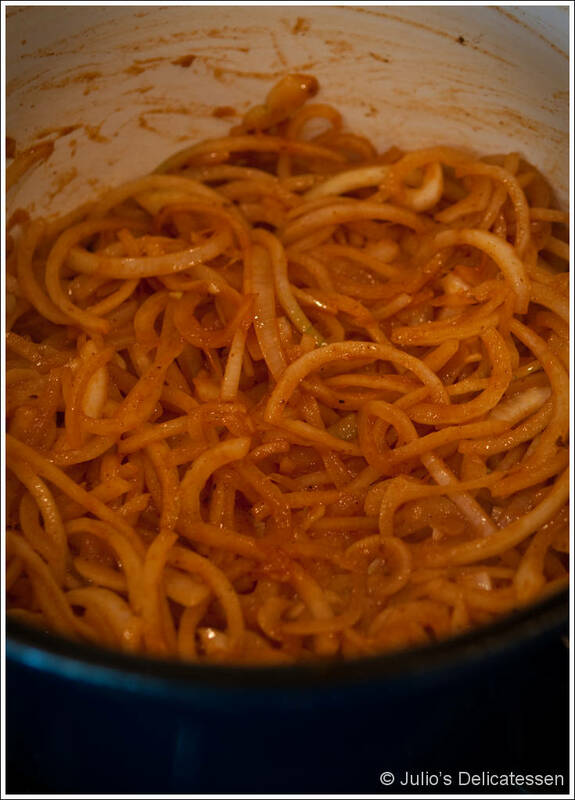 Remove the boquet garni and serve with buttered egg noodles.